Babies learn faster if their fathers engage with them in the first few months of life, a study suggests. An active male role in the early stages of babies' development produced better performance in cognitive tests by the age of two, researchers found. The team from Imperial College London, King's College London and Oxford University, says the findings show the value of early paternal involvement. They said the signs could be seen from as early as three months. The study said there was "compelling support" for the importance of a mother's impact on a child's cognitive development, but more interest was now focused on the association between father-infant interactions and development. It said previous studies had found that men tended to have a "more stimulating, vigorous" style, encouraging a child's risk-taking and exploration tendencies, which in turn might facilitate cognitive development. For the purposes of the research, fathers were videoed playing with their three-month-old babies for three minutes on a mat on the floor, without toys, and then again during a book-reading session when the child was two. The videos were assessed independently by trained researchers, giving fathers a grading on their interactions. At the age of two, the babies' cognitive development was measured in tests which involved tasks like recognising colours and shapes. The researchers analysed data for 128 fathers and - taking into account factors such as income and age - found a positive correlation between the degree to which the men engaged with their babies at three months and how those children went on to score in the tests. The positive link between involved fathers and higher test scores was seen equally whether the child was a boy or a girl. But children whose fathers displayed more withdrawn and depressive behaviours in father-infant interactions scored lower marks in the cognitive tests. The study, published in the Infant Mental Health Journal, concluded: "It is likely that remote fathers use fewer verbal and nonverbal strategies to communicate with their infants, thereby reducing the infant's social learning experience. "More withdrawn fathers also may provide a less stimulating social environment, which may thus [have an] impact [on] the child's cognitive skills." Research lead Professor Paul Ramchandani, from Imperial, said: "Even as early as three months, these father-child interactions can positively predict cognitive development almost two years later, so there's something probably quite meaningful for later development, and that really hasn't been shown much before." 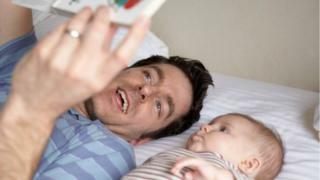 Dr Vaheshta Sethna from King's College London added: "We also found that children interacting with sensitive, calm and less anxious fathers during a book session at the age of two showed better cognitive development, including attention, problem-solving, language and social skills. "This suggests that reading activities and educational references may support cognitive and learning development in these children." Dr Sethna added: "Our findings highlight the importance of supporting fathers to interact more positively with their children in early infancy." The study comes after research by Oxford University found confident fathers, who embraced becoming a parent, were less likely to have children who displayed behavioural issues before the teenage years. This research stressed the importance of a man's attitude to fatherhood soon after birth.